So why would the Ames Foundation, which focuses on the history of law, want to have Houghton MS Typ 121 digitized? There are dozens of manuscripts of the Digestum vetus, roughly the first third of Justinian’s Digest or Pandects, which is itself the largest part of the Corpus Iuris Civilis, the compilation of texts of Roman law made by the Byzantine emperor Justinian in the year 533 CE. Houghton’s is certainly not the oldest manuscript of the Digest. There is one that was compiled in the late 6th or early 7th century that is in the Laurentian Library in Florence. 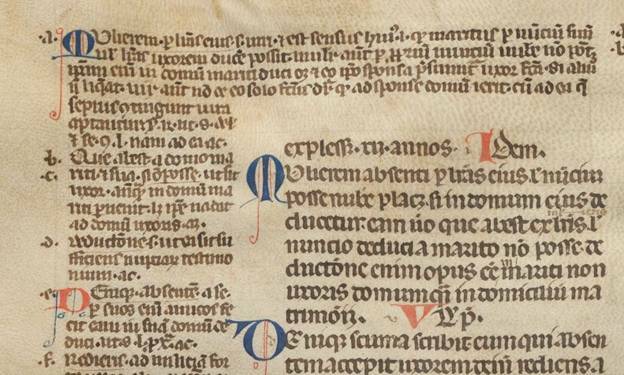 Nor is it the oldest manuscript that contains the Accursian gloss, an elaborate series of marginal notes that summarized a century of work on this text, and that was compiled around the year 1240. It is, however, an early example of the Vulgate text of the Digest, which differs somewhat from the modern critical edition, and it contains the Accursian gloss from a period relatively close to the compilation of the gloss itself. The Vulgate text and the Accursian gloss were the base texts of Roman law that were used by jurists from the mid-13th century until well into the early modern period. The Ames Foundation has published on its website ‘metadata’ for one of the last editions the Vulgate text with the Accursian gloss, printed in Lyon in 1604. It has recently added the ‘metadata’ for the Houghton manuscript to the same site. The basic text of the Lyon edition is not quite the same as that used by the jurists of the Middle Ages. Scholarship had already begun to construct a text that was closer to that issued by Justinian’s compilers. The jurists of the sixteenth and seventeenth centuries were also less interested in the gloss than were the jurists of the Middle Ages. Early modern editions of the gloss simply reprinted the gloss as it had appeared in the first printed editions of the late 15th century. It was not a particularly good text to start off with, and errors tended to multiply. Hence, if one is interested in medieval legal thought, it is important to make sure that one is using a text that is as close as possible to the one that the medieval jurists were using. The text is a critical one for answering a question that is still debated among Romanists today: what were the requirements for forming a lawful marriage in Roman law? The second century jurist Pomponius seems to be saying that in addition to the consent of the parties, which he assumes, there must be, at least in the case where the parties were not in each other’s presence, a leading of the bride into the house of the groom. In the Middle Ages, the validity of marriage was not determined by Roman law but by canon law. Canon law did not require a leading of the bride; all that was required was the parties’ consent. The medieval jurists knew this, and, it has been argued, they interpreted the texts of Roman law to make them conform, to the extent that they could, to the prevailing requirements in their own day. The base text of Digest 23.2.5 is that same as that of the modern critical edition. It is accompanied, however, by an elaborate commentary, including a casus, a summary of the case, by the thirteenth-century jurist Vivianus Tuscus, and glosses on the words per literas eius, que abest, non posse, and deductione. The first and most obvious difference is that the casus of Vivianus Tuscus is not there. That casus is of some interest, not least because the attempt to reconcile the Roman text with the medieval canon law is quite obvious in it. What we learn from the Houghton manuscript is that the casus was not included in this mass-produced, Bolognese text of the Digestum vetus. We can probably assume that it was not in other such texts. Hence, if we are asking the question what a medieval jurist of the 14th or 15th centuries would have been looking at as he was trying to make sense out of the Roman law on the formation of marriage, we cannot assume that he would have had the guidance (or the misleading, depending on how one looks at it) of the casus. The basic text in the Houghton manuscript is not quite the same as that in the modern and 1604 editions. Where the modern and 1604 editions read nuntio suo duci a marito, the Houghton manuscript reads nuncio deduci a marito. We will see that the absence of suo allows one glossator slightly to change the story. The reading deduci for duci, moreover, resolves an ambiguity that was present in the original Roman text. If we read duci, the text could be saying that you cannot have a leading of an absent woman, or it could be saying that the absent woman cannot be married to the man (uxorem ducere being the standard phrase describing a man’s marriage). The reading deduci removes the ambiguity. The Houghton text speaks of the deductio, the leading of the bride; it says nothing, except by implication, about the validity of the marriage. The text of the first gloss (‘a’) is not quite the same as that in Lyon 1604. Where the Lyon text reads huius legis ut, the Houghton text reads huius legis quod, which is more standard medieval Latin, and the insertion of de before eo solo in the Houghton mansuscript makes the text a bit clearer.Where the Lyon text reads si aliud non liqueat, the Houghton text reads si aliu si liqueat, which makes no sense, and is clearly a scribal error. (There may be an interlined d over aliu, but that is probably a redundant abbreviation for the est of potest above it.) Both texts make clear that the absence of suum with nuntium in the base text allowed the medieval jurist who wrote the gloss to give the woman more agency (per proprium nuntium), and both texts tell us that by the leading of the bride into the house of the groom, praesumitur uxor facta, an idea borrowed from canon law and not warranted by the text. The most important difference between the text of the two glosses, however, is that the Houghton manuscript adds ac at the end. This is the siglum of the jurist Accursius, the compiler of the apparatus of glosses. Knowing that this is a gloss attributed to Accursius, we can rethink what we should make out of secundum R which appears in both texts. Not knowing that the gloss contains Accursius’ siglum, we might imagine that it was a gloss of Rogerius, a 12th century jurist. Knowing that it contains the siglum of Accursius, it seems more likely that secundum R should be expanded to secundum responsum, i.e., according to the responsum given by Pomponius in the base text. Rogerius died around 1170. The canonic doctrine of presumptive marriage was not developed until the 1190’s. If we ascribe this gloss to Rogerius, we have to assume that a distinguished civilian anticipated the canonic development by almost a generation. If we ascribe the gloss to Accursius, there is no problem. Accursius was in this case, as he was in many others, simply reflecting the prevailing canonic doctrine of his time. Thanks to Charles Donahue, Jr., Paul A. Freund Professor of Law at Harvard Law School, for contributing this post.